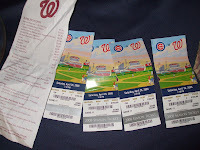 Yesterday we went to Washington DC to watched the Nationals against the Chicago Cubs. It was a good game even though the Nationals lost. Seeing all those thousands of people in the stadium made me feel so much excitement. It was so incredible to be in the same place with so many people at the same time. I have never been so privileged to get tickets like this as a gift. We were able to watched the game from really nice seats and enjoyed a whole bunch of really good food. The stadium was brand new we watched the first couple of games there. Even the people who worked there were not sure what was supposed to happen in the stadium. We were lucky too because it started to rain as we were walking back to the car. It rain very hard in a short period of time. Over all it was a fun game however, we got home soooooo late. Next time I think I want to see a game closer to home or else see a Professional Football game my Babe Dako loves to watch it for sure!